First off let me say sorry for the lack of updated fishing reports! It has been awhile. My excuse is, well I don’t really have one so I apologize and I will be posting more frequently in the future. The good news is that our snow pack in the Island Park area is at 100 percent of average and more snow is forecast for the coming weeks. I don’t think we are quite out of the woods yet but things are most certainly looking up. Hopefully we will get a couple more good storms followed by a wet spring. I had my two sons up here in Island Park with me over the weekend and my youngest wanted to see how deep the snow was. He walked into an open area took off his snow shoes and sunk up to his neck, one lost snow boot later we are guessing around four feet! Let’s talk about fishing, this is the week to be out and about! With temps hovering between 30 to 35 degrees the Midge fishing should be outstanding. I would also bet that fish will be chasing streamers around as well. The Box Canyon continues to fish well. 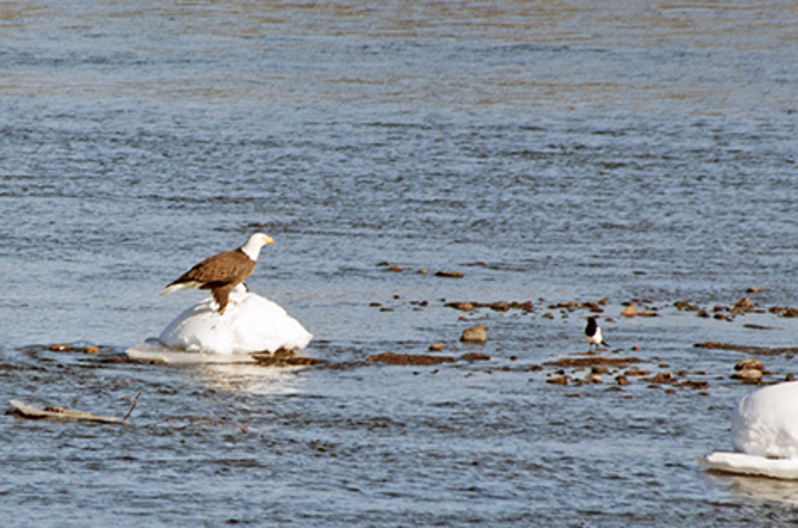 Flows out of the Island Park Reservoir are 123 cfs making wading your best bet. The road is plowed to the dam so access for wading is not a problem. Lots of trout are being caught right at the access with small bead heads. Zebra Midges in # 16 and #18s are always a good bet. Smaller Black Rubber Legs #10 and #12s trailed by Glo Bugs have also been fooling larger Trout. As always don’t forget your Streamers if you’re going to fish the Box. The key with streamers is to slow down your offering. I like sculpin patterns and my favorite hands down is Lawson’s Wool Head Sculpin. I really like fishing olive in the Box Canyon. Keep in mind it’s winter and while 35 degrees may feel balmy and warm it’s still cold and a fall in the river can be dangerous so bring a change of clothing and layer up. I am willing to bet the Henrys Fork below Ashton is going to be worth a look this week. The only issue I can think of is access. Both Vernon and Ora parking areas are plowed for walk/wade access but the boating areas are not open. Also the last time I checked Warm River to Ashton was not plowed. There is great wade fishing to be had all up and down the Henrys Fork this time of the year so that is always an option. The last thing I can tell you is check both your put in and take out! Nothing worse that coming to a take out at the end of the day only to find there is no take out! As far as flies I would come armed with a bunch of smaller Bead heads like #16 Red Sawyers, #16 and #18 Tungsten Torpedoes, #14 #16 and #18 Pheasant Tails and Don’t forget your Rubber Legs. I would have both black and brown in #8s through #12s. As always bring plenty of Zebra Midges #16 and #18s in black, red and brown. You will most likely find some fish eating Midges on the surface as will so make sure you have Griffiths Gnats with you. I like have #14s through #20 for adult Midges. Accessing the Teton is most definitely an issue this time of the year. Large sections of the Teton were completely frozen over and the bank ice extends out into the river a good ways, never trust back ice! I have learned that lesson the hard way. With warming temps there may be couple places where you can access on foot but a pair of snow shoes would be a good Idea. Keep your fly selection the same. 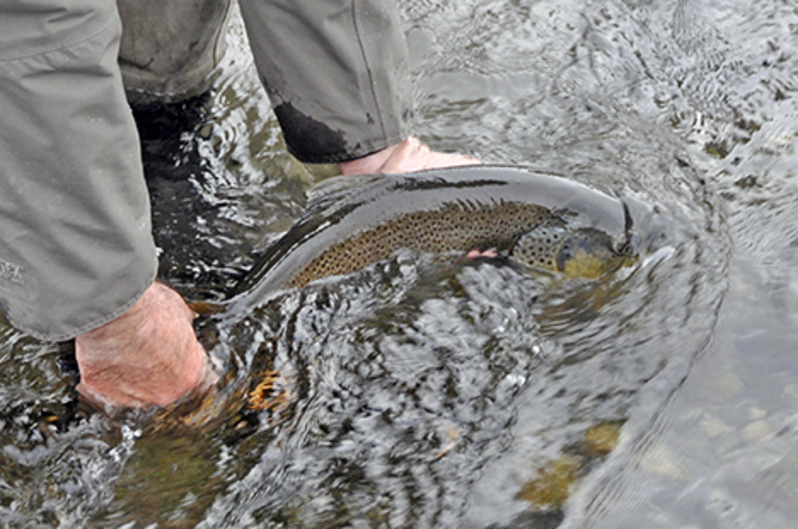 Small beads rubber legs and a selection of adult Midges with handful of Streamers should keep you busy on the Teton. 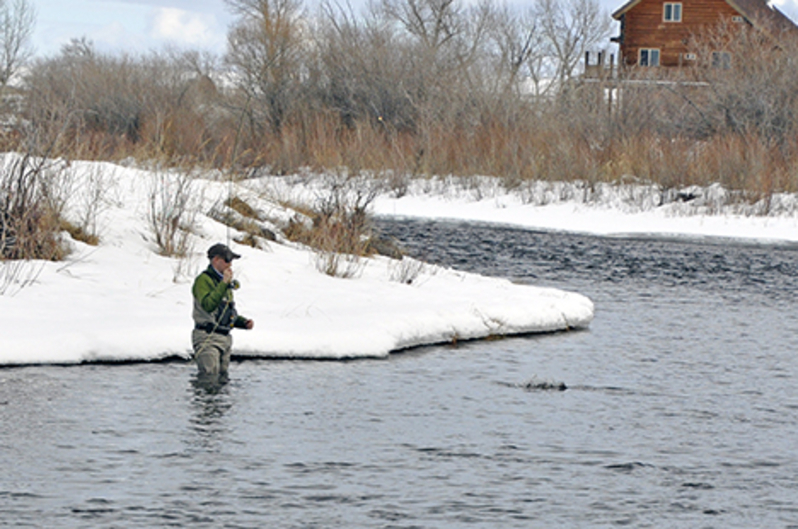 The South Fork has been fishing well but once again access is an issue if you want to float. Plan on pushing your boat over snow banks and bring plenty of rope to get the boat out. Personally I have always enjoyed wading the river this time of year and finding a pod of Cutties eating Midges on the surface can provide hours of great fun. 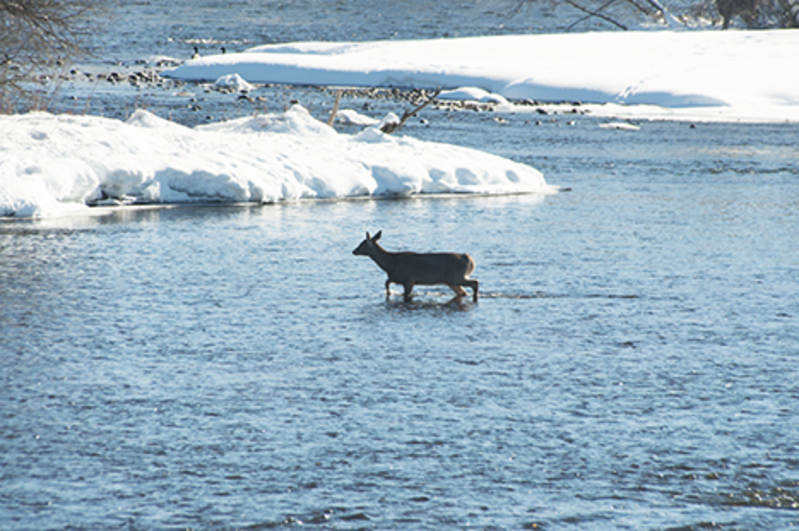 The River is just under 1000 cfs so wading is not an issue. I would again bring some snow shoes or cross country skis to get you to the river. Fly selection remands the same. I would however add Chartreuse Glo Bugs to your mix. Try fishing a Chartreuse Glo Bug with a small #16 or #18 red Zebra Midge off the drops and through the Riffle water on the South Fork. I would concentrate my efforts on the upper river near Reynolds Pass. We also had a great report from some anglers who were fishing near the Storey Access. Look for trout eating Midges on the surface and I would make sure I had smaller Griffiths Gnats # 20 and #22s. Streamer fishing is also not a bad call and Scupzillias as well as Egg Sucking Leaches should turn some heads for you. Don’t forget you will need a new License March 1st. We are open 6 days a week always have a guide available so give us a call. Also we have a great selection of Cross Country Skies and Snowshoes for rent. 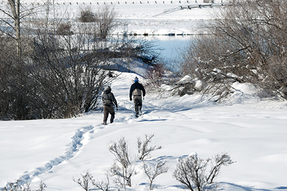 Beat the cabin fever and ski Harriman Ranch. It’s very beautiful and a great way to spend some time with family and friends. We still have some great sale item so come in and say howdy!